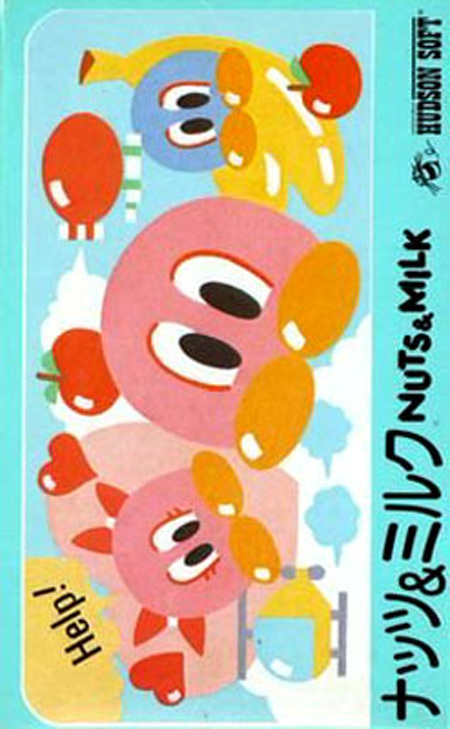 Originally developed by Hudson Soft for several home computers in Japan, Nuts & Milk became the company's first Famicom video game. The game itself borrows elements from Lode Runner and other arcade-styled platformers such as Donkey Kong Jr, and even emulates the title screen of Nintendo's early 80s releases. While the game retains stylistic similarities to other games published at the time, it is unique in being an arcade-styled game that was never released on an actual arcade system. Two unique versions of the game were created: one for the Famicom, and one for the home computers. Both versions of Nuts & Milk involve the player moving through various levels while collecting an assortment of fruit scattered throughout each one. By gathering all the fruit on a particular screen, the player will gain access to a previously unopened house door containing Milk's fiance. When the player makes contact with the female blob, they are advanced to the next level to start the process anew. Movement through these levels is accomplished by using the directional pad or keyboard to move Milk across the stage while avoiding pitfalls and other obstacles, most notably the character's rival, Nuts.